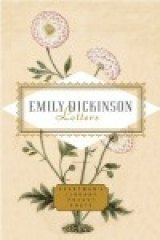 Though Emily Dickinson spent much of her adult life in familial seclusion, almost never leaving her father's house, a new Pocket Poets edition of her letters, edited by the poet Emily Fragos, reminds us of the way in which Dickinson remained involved in events and people outside her famous second story room. As Fragos writes, she "never forsook human relationships...daily participating in a busy household and sending herself out into the world through her passionate, witty, mournful, and celebratory letters." This one, written on the occasion of her mother's death, is perfect Dickinson: individual phrases are so alive ("cultivated to tenderness by persistent sorrow"!) one must stop to read them several times. I hoped to write you before, but mother's dying almost stunned my spirit. I have answered a few inquiries of love, but written little intuitively. She was scarcely the aunt you knew. The great mission of pain had been ratified—cultivated to tenderness by persistent sorrow, so that a larger mother died than had she died before. There was no earthly parting. She slipped from our fingers like a flake gathered by the wind, and is now part of the drift called "the infinite." We don't know where she is, though so many tell us. Mother was very beautiful when she had died. Seraphs are solemn artists. The illumination that comes but once paused upon her features, and it seemed like hiding a picture to lay her in the grave; but the grass that received my father will suffice his guest, the one he asked at the altar to visit him all his life. I cannot tell how Eternity seems. It sweeps around me like a sea...Thank you for remembering me. Remembrance—mighty word. "Though gavest it to me from the foundation of the world."